Glazed Baby Drumsticks will be very popular by children and adults alike, whether you're serving them at the table, or as finger food at a BBQ. Cut wing in half through joint. Hold small end of bone. Use a knife to free meat from bone. Scrape flesh down bone to large end to resemble small drumsticks. Add chicken, and refrigerate overnight, stirring occasionally. Pour chicken and marinade into a baking dish. Bake at 180°C for 40 to 45 minutes, basting occasionally. Serve with salad and rolls, or if preferred, on a serving platter at a BBQ. 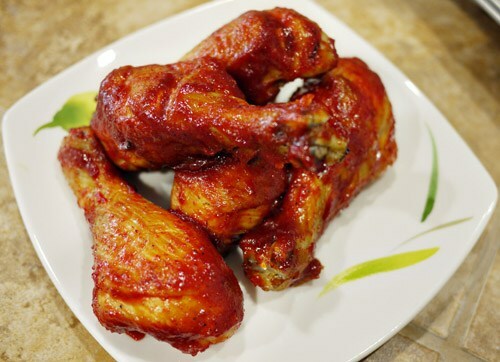 Note - if you prefer, you can simply use Chicken Wings for this recipe, without separating at the joints.